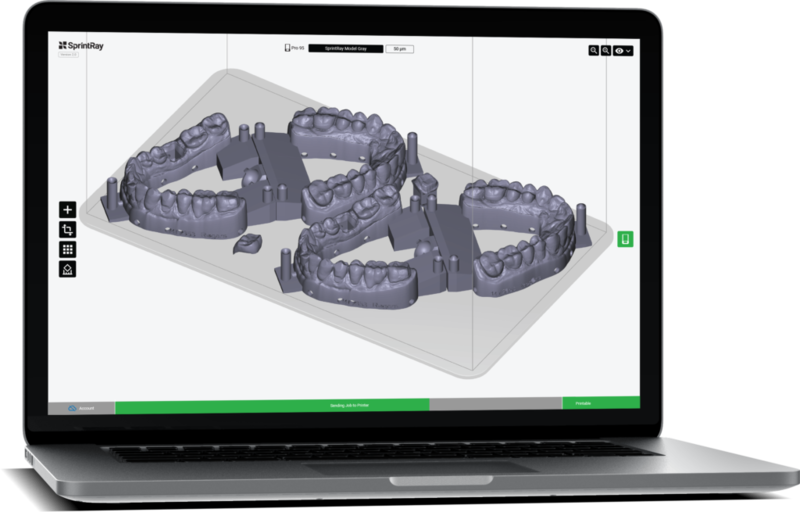 Dental 3D Printing: A Forward-looking Review – SprintRay Inc.
A guide to dental 3D printing must-haves in 2019. 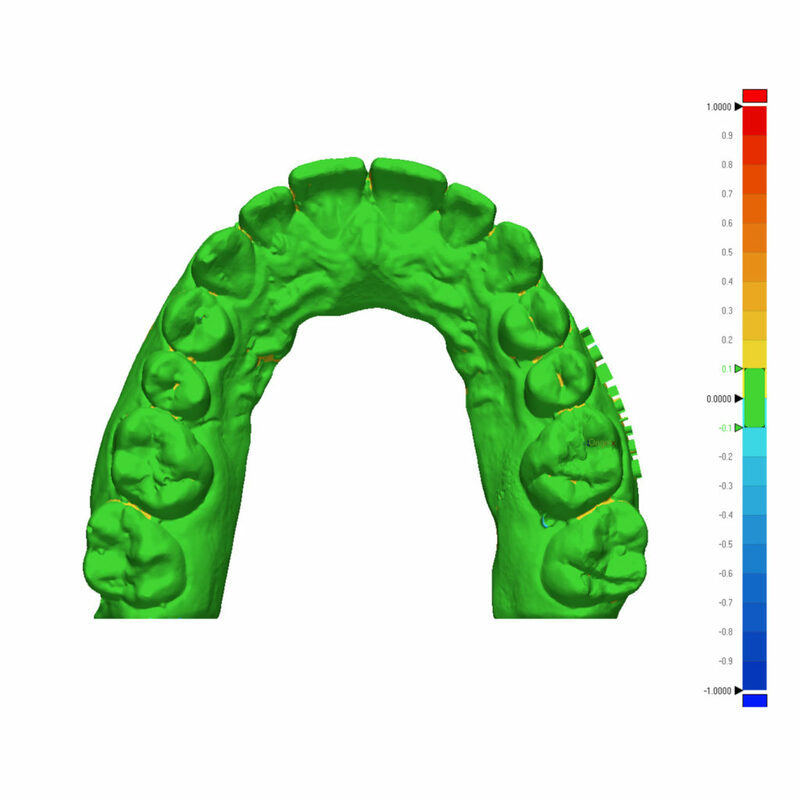 Last year, 3D printing came to digital dentistry in a big way. FDA-cleared biocompatible materials expanded the production capabilities for dental 3D printing, paving the way for myriad new indications for final placement. Though this year has only just begun, a handful of new product offerings have already been announced. The cat seems to be out of the proverbial bag: it’s no longer a secret that dental 3D printing is projected to become very big business in the next decade. Small printers are set to become big business in the next 10 years. But when it comes to adding a dental 3D printer to your practice, it can be hard to know where to begin. Dozens of companies claim to make 3D printing hardware for dentists and it can seem as if they each speak their own language of specifications and features. Trade show floors become more crowded each year with new competitors claiming to have built the ultimate dental 3D printer. For the practicing CAD / CAM digital dentist, choosing the right hardware can dramatically increase revenue and margins, improve patient care, and offer unparalleled control over the treatment process. Is the printer’s software and hardware ecosystem open to and integrated with other popular CAD / CAM systems? Does the printer operate accurately enough for your intended clinical use and fast enough for your current and projected needs? Is the hardware and software ecosystem end to end and fully supported by live technicians? Are there additional costs for such support? If you keep these three items in mind as you research the right system for your dental 3D printing needs, you’ll be well on your way to a totally digital in-house workflow, from scan to output. The allure of in-office fabrication is unprecedented output and control. Once you’ve decided to add any new piece of technology to your clinic, it is wise to consider how it will fit in with your current clinical setup. A dental 3D printer, just like a mill or scanner, comes in gradients of openness with respect to software and materials. Each of these systems has its own drawbacks and advantages. A closed resin ecosystem simply means that a given printer is compatible only with specific resins – typically those manufactured by the maker of the printer. Closed systems tend to be quite reliable, as the resins are purpose-built to work with the printer’s hardware. Similarly, their software compatibilities tend to be narrower but, at least theoretically, more reliable. While the locked-in hardware and software systems can provide a more seamless experience, they disallow the spontaneous usage of outside products. Third party resin manufacturers have been essential to enabling new indications for dental 3D printing, so these systems reduce a clinic’s ability to adapt new technology. Their closed software systems can force doctors into specific, expensive paid ecosystems. A true open-system dental 3D printer has the advantage of being able to leverage any compatible material from any manufacturer. These printers can also integrate with almost any software system, theoretically adapting more easily to your current hardware and workflow. But while these systems’ openness is their main selling point, it is also their greatest drawback. Because dental 3D printing is relatively new, many companies are still jockeying for control over what ‘standard’ means. Rather than simply offering a system that work keyturn, these printers often require a fair bit of tinkering. Software integration is often partial or nonexistent, meaning there are no smooth handoffs between the design and printing phases. SprintRay sits comfortably between these two extremes. Open certified systems balance openness with ease-of-use, allowing for the use of 3rd party resin and software but within the structure of first-party support. In practical terms, this means that clinicians can use any of a myriad of materials, scanners, and CAD software while still receiving support from SprintRay. Moreover, an open certified system requires less fiddling than a fully open system. 3rd party materials and software are tested and the necessary settings are pre-configured so that they function seamlessly. Open certified systems can have longer lead times than fully open systems, but their usage is as simple as plug and play. To learn more about open certified resin systems, refer to our dental materials guide. Expanded applications are available for dental 3D printing, but they often exist only outside of locked-down resin ecosystems. Most dental 3D printers claim that they’re fast – it’s tantamount to their pitch that they can create dental appliances faster than alternative methods of manufacturing. But while some list their speed, usually in inches- or millimeters-per-hour, many do not. There is sometimes good reason for this – printing with a resin that produces flexible indirect bonding trays requires considerably different settings than simply making a restorative wax-up model for patient examination. Most 3D printers that use digital light projection technology achieve reasonable speeds of at least two inches per hour of vertical printing. DLP printers also have the distinct advantage of being able to print one entire layer at a time, allowing you to fill the entire build platform with models without affecting your print times. 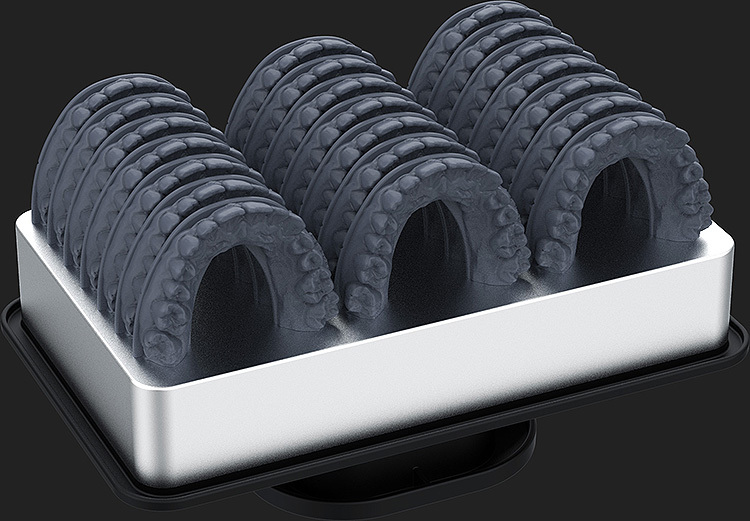 Brand-new technology SprintRay Pro breeds improved speed, accuracy, and repeatability. When trying to determine an individual printer’s accuracy, there are three components to keep in mind. First: the minimum feature size on the Z-axis: this determines how thin the layers can be. When the Z-axis height is decreased, the printing process takes much longer, but certain dimensions are fabricated with higher fidelity. Most dental DLP printers range from 25 to 100 microns, a setting which can be adjusted using the software. The XY-axis minimum feature size is most often what is referred to as ‘accuracy’, though this wholesale term hardly captures the entire story. XY minimum feature sizes vary from 100 to around 50. This size is fixed for any given printer, and a smaller number means a higher theoretical accuracy capability, though accuracy and resolution are by no means the same thing. The third way to understand accuracy is by scanning an object, importing the scan into a print job, and then scanning the printed product. This process is more intensive but gives a truer, more holistic picture of exactly how well all of the components of the printer work together. Some companies provide their own internal accuracy studies, but the most reputable are those performed independently by universities and research organizations. Making models is about much more than you can see on a spec sheet. True accuracy and repeatability require outside testing and a commitment to hardware quality. The simplest way to think about throughput is that it’s the build platform surface area multiplied by the printer’s vertical print speed. Roughly, this number gives you the number of models you can produce per hour on a given printer. But, though this method is convenient, throughput is actually much more nuanced than this. 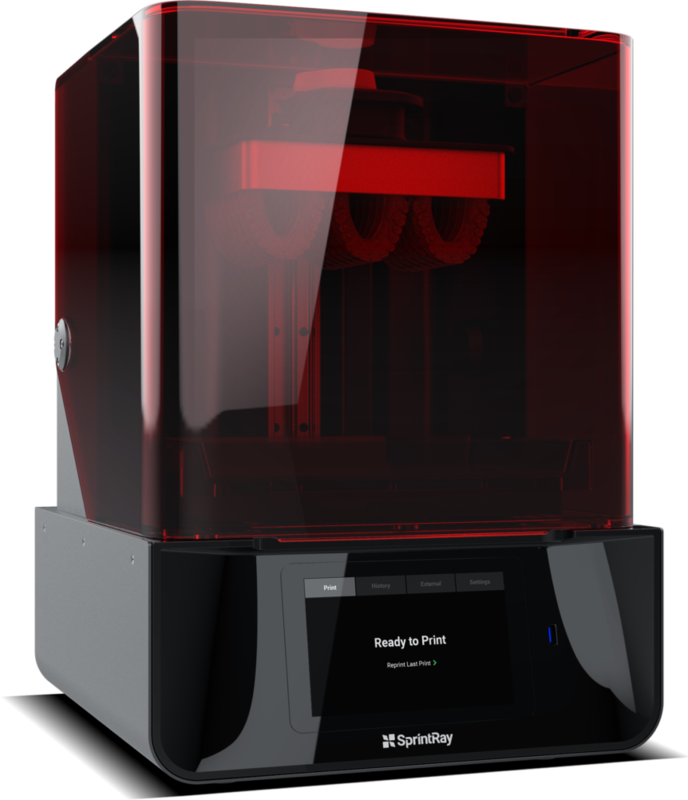 For a dental 3D printer in the real world, throughput is largely determined by how user-friendly it is. In the clinical world, the daily task of production is often offloaded to an office assistant. If the print-prep, hardware, and post-processing steps aren’t easy to follow, production can be significantly hampered, leading to lower throughput. A more sophisticated way to think about throughput, then, includes elements of user-friendliness, speed, and build volume. 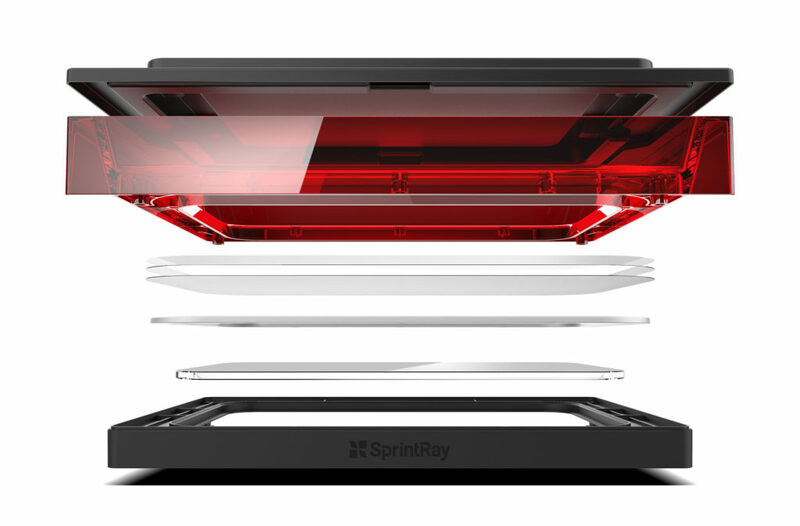 SprintRay Pro features a powerful onboard computer that delivers contextual help videos, which can drastically reduce mistakes and shorten the learning curve. Printing a platform of full-arch models is impressive but requires some foundational knowledge of CAD software. SprintRay Pro makes it easy though user-friendly software and onboard help videos. Dental 3D printing is ready for prime time with user-friendly designs, incredible production speeds, and proven ROI. At the same time, it’s important to remember that additive manufacturing is still a growing technology. While software and hardware operate in harmony to create appliances like clear aligners and denture bases, the future holds innumerable new indications. When thinking about adding a printer to your dental practice, consider what types of resources are out there for your chosen hardware. Is there a robust community of dentists and labs who are engaged and collaborating on helping each other? Is there a large, open resource bank provided the the company that serves to build fundamental technological understanding? Community and support are two items that often get overlooked in the purchasing decision because they don’t really fit on a spec sheet. The ability to reach out to fellow clinicians who have similar experiences is invaluable. SprintRay’s large and active user’s group is just one example of such a place, where dentists and lab technicians offer advice and work together to push the boundaries of what’s possible with 3D printing. As with integrating any new piece of technology into your clinical workflow, you’re going to have questions. Getting those questions answered in a timely manner by live technicians is tantamount to keeping things running smoothly, so pay close attention to what the customer support process is for your chosen dental 3D printer. SprintRay offers free one-hour training sessions for everyone that buys our printers. These sessions can vary from informal Q&A to step-by-step instructions to specific demonstrations. Getting questions answered, especially if you’re new to dental 3D printing, sets you up for success. Many companies don’t even list a phone number for their support teams, so ensure you understand what kind of backup you can expect before making a purchase. SprintRay Software is extremely user-friendly. But that doesn’t mean you won’t want to push the limits of what you can do. A vibrant community and top-notch support technicians can help with that. Choosing a printer for your practice seems so simple: find the features you need, purchase the least-expensive model that provides those features. But when you start the research process, it quickly becomes much more complicated. The differentiation between printers reduces each year as technologies become more standardized. Open and integrated software and hardware. Accurate prints, sufficient speed and throughput. A full support system including live technicians. If you can find a dental 3D printer that includes all three of these crucial elements at a price point you find palatable, then you’re setting yourself up for clinical printing success. 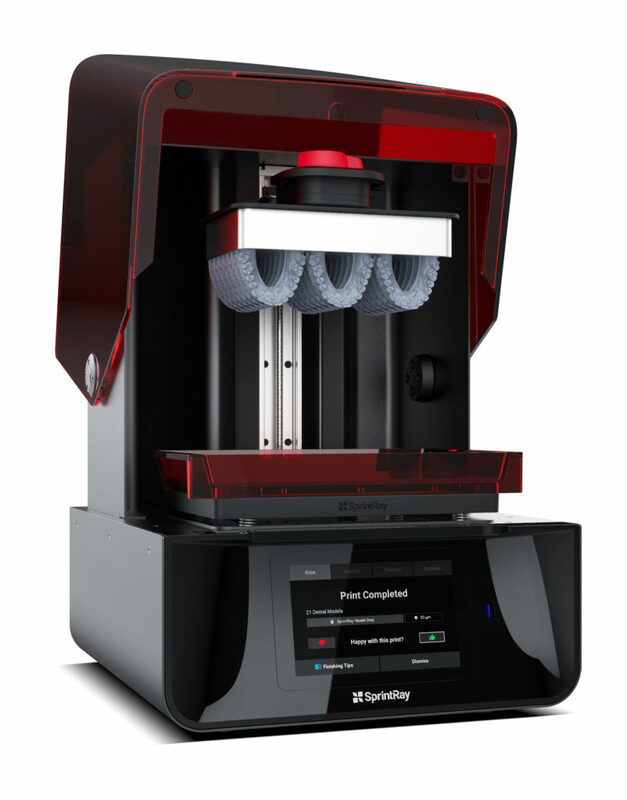 A full dental 3D printing ecosystem includes software, printing hardware, and post-processing. SprintRay’s Pro line delivers the right balance of openness and support. To see what SprintRay dentists have to say about 3D printing in their offices, check out our video interviews featuring Dr. Chetty and Dr. Shao. 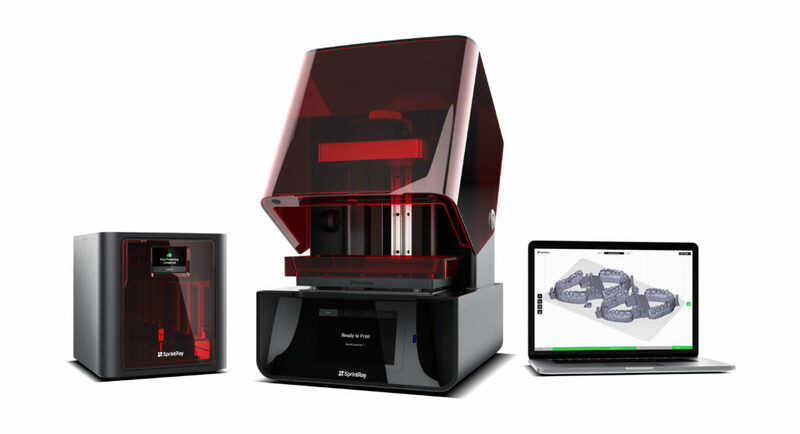 Questions about bringing 3D printing into your office? Check out our dental 3D printing buyer’s guide. For specific questions about how 3D printing would impact your practice, schedule a time to speak with our highly-experienced dental sales team.